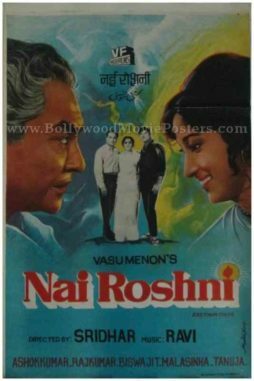 Old Bollywood poster for sale of the Hindi film, Nai Roshni (1967). 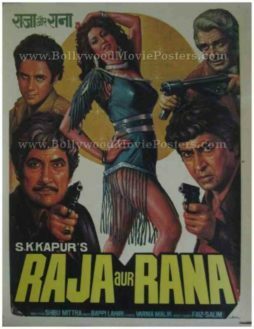 This is an actual surviving vintage Bollywood poster of the 1967 Hindi film that starred Ashok Kumar, Mala Sinha and Raaj Kumar in lead roles. 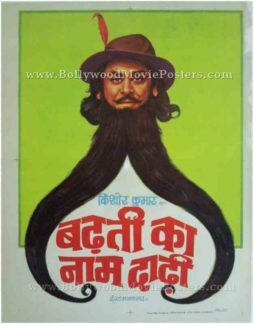 Printed and circulated during the first release run of the film (late 1960s), this old Bollywood poster was designed and printed for publicity of the movie but never ended up being used. This vintage Indian film poster for sale was originally designed in hand painted oil on canvas format. 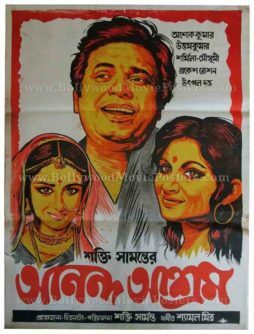 Large hand painted side profiles of Ashok Kumar and Mala Sinha are seen prominently on either side of this vintage Bollywood poster. The background is painted using a gradient of blue, yellow and green. Actor Raaj Kumar is seen in a black and white photographic still pasted on the center of this old Bollywood poster for sale. 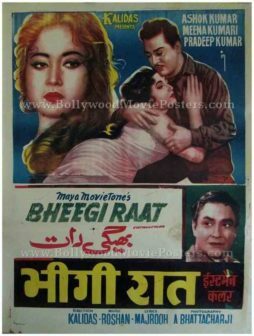 Vintage Bollywood poster of the old Hindi film Bheegi Raat (1965) for sale. This is an actual surviving old Hindi movie poster of the 1965 film that featured the Tragedy Queen of Bollywood, Meena Kumari in the lead role. 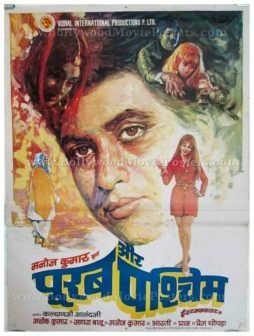 Printed and circulated a few years after the first release of the film (1970s), this vintage Bollywood poster for sale was originally designed for publicity of the film but never ended up being used. This old Bollywood poster was originally designed on a hand painted canvas by a small time art studio in Delhi, giving it a very quirky feel. Bheegi Raat is a 1965 Bollywood movie starring Ashok Kumar, Meena Kumari and Pradeep Kumar. 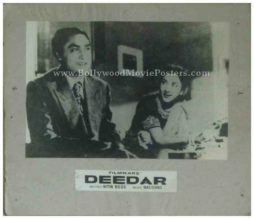 Black and white old Bollywood photo stills of the Hindi film, Deedar (1951) for sale. This is an actual surviving set comprising three old Bollywood lobby cards of the 1951 hit that starred the ultimate method actor Dilip Kumar in the lead role opposite Nargis. Printed and circulated a few years after the first release of the film (1950s), this set of three old Bollywood black and white pictures was printed for publicity of the film inside a cinema hall but never ended up being used. Black and white old Bollywood movie stills of the Hindi film, Raag Rang (1952) for sale. This is an actual surviving set of old Bollywood lobby cards of the 1952 Hindi film that starred Ashok Kumar and Geeta Bali in lead roles. 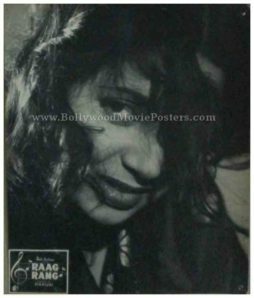 Featured here for sale is a rare surviving set of Bollywood movie lobby cards of the film Raag Rang (1952) comprising a total of 6 old Bollywood movie stills! Printed and circulated during the original first release of the film (early 1950s), these old Bollywood black and white pictures were printed for publicity of the film inside a cinema hall. This beautiful vintage set comprising 6 old Bollywood movie stills was designed and printed for publicity of the film and was actually used inside a theater that screened the film Raag Rang. The corners of each lobby card display visible pin hole markings – tell tale signs of being pinned on the notice board of a movie theater. 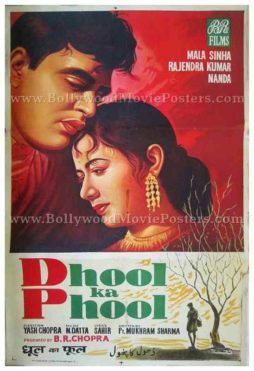 Old Bollywood movie poster of the Hindi film, Dhool Ka Phool (1959) for sale. This is an actual surviving original vintage Bollywood movie poster of the 1959 Hindi film that was produced by B. R. Chopra and directed by the “King of Bollywood Romance,” Yash Chopra. Dhool Ka Phool marked the debut of Yash Chopra as director, making this poster highly collectible! This vintage Bollywood movie poster features stunning hand painted artwork created by one of the greatest Bollywood poster designers of his time, V.G. Parchure of Pamart Studio. A stunning hand painted portrait of the lead couple Rajendra Kumar and Mala Sinha in a romantic pose is seen prominently on the poster. The poster is set against a red background. Originally hand painted on canvas by master Bollywood poster painter V.G. Parchure, this vintage Bollywood poster bears his printed signature in the name of his art studio on the bottom right. 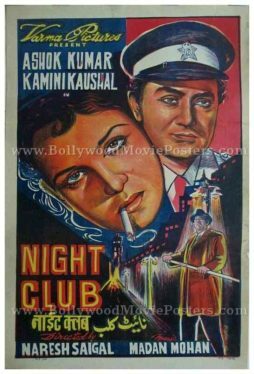 Old hand painted Bollywood poster of the black and white Hindi film, Night Club (1958) for sale. 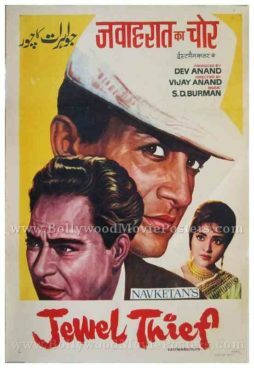 This is an actual surviving original vintage Bollywood poster of the 1958 hit Hindi film that featured Ashok Kumar and Kamini Kaushal in lead roles. Printed and circulated a few years after the original first release of the film (early 1960s), this old hand painted Bollywood poster was originally designed for publicity of the film but never ended up being used. This quirky hand painted Bollywood movie poster features a woman smoking a cigarette prominently on the center – a taboo for the time, making this poster extremely unique and highly collectible! Lead actor Ashok Kumar is seen alongside wearing a police uniform in a quirky hand painted portrait. 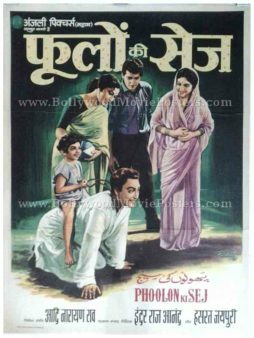 Very rare old Bollywood poster of the 1964 black and white Hindi film, Phoolon Ki Sej for sale. 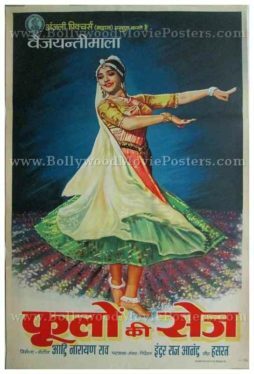 This is an actual surviving vintage Bollywood poster of the 1964 hit Hindi film that featured the dancing queen of Bollywood, Vyjayanthimala in the lead role. Printed and circulated during the original first release of the film (early 1960s), this old hand painted Bollywood poster was originally designed for publicity of the film but never ended up being used. This artistic hand painted Bollywood poster features a stunning portrait of Vyjayanthimala dancing. Her twirling dress is fabulously captured by the artist and accentuated with streaks in the background. Phoolon Ki Sej is a 1964 black and white Bollywood movie that starred Vyjayanthimala, Ashok Kumar and Manoj Kumar in the lead roles. Nirupa Roy, Lalita Pawar, Mehmood and Shubha Khote also starred as supporting actors in this film. Spectacular vintage hand painted Bollywood poster of the old Hindi film Bheegi Raat (1965) for sale. This is an actual surviving old Bollywood poster of the 1965 film that featured the Tragedy Queen of Bollywood, Meena Kumari. Printed and circulated somewhere during the first release of the film (Mid 1960s), this old Bollywood poster for sale was originally designed for publicity of the film but never ended up being used. This vintage Bollywood poster was originally designed on a hand painted canvas by one of the finest Bollywood movie poster artists of all time, DR Bhosle. Known for his restrained and simplistic approach, this Meena Kumari poster bears DR Bhosle’s tell tale signs of mastery. 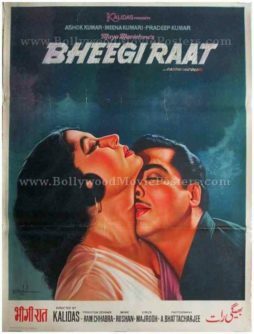 In this Bheegi Raat poster, Tragedy Queen Meena Kumari and actor Pradeep Kumar are seen in a passionate embrace. This is one of the finest minimal Bollywood posters ever produced by DR Bhosle, making it highly collectible. The poster is set against a cloudy background. The title of the film uses an interesting typeset comprising fine brush strokes to give it a “rainy” look to reflect the name of the film. Artist DR Bhosle’s original signature appears on the bottom left hand corner of the poster. Very rare original old Bollywood poster of the 1964 black and white Hindi film, Phoolon Ki Sej for sale. Printed and circulated somewhere in the 1960s, this old Bollywood poster was originally designed for publicity of the film but never ended up being used. This artistic hand painted Bollywood poster features a stunning portrait of Ashok Kumar at the bottom. Manoj Kumar, the Tragedy King of Bollywood is seen standing at the center of the poster. The title of the film is written in a very stylish font in Devanagari on the top. Extremely rare, original vintage Bollywood movie poster of the blockbuster hit, Mahal (1949) for sale. This is an actual surviving publicity poster of the landmark 1949 Hindi film starring Ashok Kumar and Madhubala in lead roles. 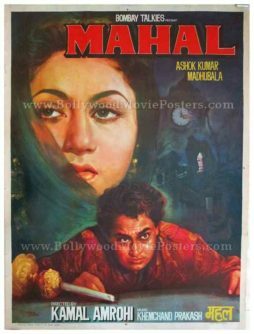 Mahal is regarded as a landmark film in Indian cinema due to several firsts, chiefly: It has the distinction of being India’s first reincarnation thriller, opening up a completely new genre of gothic fiction in Indian cinema. Produced by Bombay Talkies, Mahal marked the directorial debut of Kamal Amrohi. Mahal launched playback singer Lata Mangeshkar (the Nightingale of India) into super-stardom, with the hit song, “Aayega aane wala.” Mahal was the first film to star Madhubala (only 16 at the time) with her screen name as “Madhubala” in the credits. She was earlier credited as Mumtaz (primarily cast as a child artist). Printed and circulated during the first release of the film (somewhere in the late 1940s / early 1950s), this vintage Bollywood poster was printed for publicity of the film but never ended up being used. This very rare old Bollywood poster features stunning hand drawn artwork. The Bollywood poster artist who hand painted this masterpiece captures the alluring beauty of actress Madhubala in a large hand drawn portrait on the top, while Ashok Kumar is seen at the bottom. 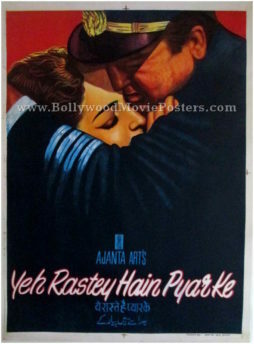 Typography used in the poster is primarily in English, with a translation of the title in Hindi at the bottom. Mahal is a 1949 Bollywood movie starring Ashok Kumar and Madhubala in lead roles. It is credited as being India’s very first reincarnation thriller. Produced by Bombay Talkies, Mahal catapulted the career of Lata Mangeshkar with the hit song “Aayega Aane Waala” that is played till today. Mahal was one of the biggest box office hits of 1949 in India. Spectacular hand painted Bollywood movie poster of one of the memorable patriotic films in Indian cinema, Purab Aur Paschim (1970) for sale. This is an actual surviving vintage poster of the 1970 romantic Hindi film that featured Manoj Kumar and Saira Banu in lead roles. Printed and circulated during the release of the film, this vintage movie poster was originally designed for publicity of the film but never ended up being used. This poster was originally designed on a hand painted canvas making it highly collectible. 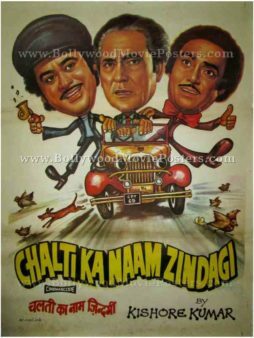 The poster captures the lead protagonist Manoj Kumar in a spectacular hand drawn portrait at the center, with other characters seamlessly appearing surrounding him. Typography used in this poster is completely in Devanagari Hindi, except for the production credits at the top which appear in English. Purab Aur Paschim (East & West) is a 1970 Hindi film produced and directed by Manoj Kumar, who starred in the lead role opposite Saira Banu. The other cast of the film included Ashok Kumar, Pran and Prem Chopra. The music of the film was composed by Kalyanji Anandji. This was the second film by Manoj Kumar where he appeared as a character named “Bharat” or “India” (the first being Upkar) and his fourth film on patriotism (Shaheed, Roti Kapda Aur Makaan and Kranti). The name stuck on and Manoj Kumar is routinely referred to as “Bharat Kumar” till today. Shot in London during the height of the hippie movement of the 1960s, Purab Aur Paschim captured the free spirited lifestyle of the British. The lead actress of the film, Saira Banu is cast as an Indian woman who has been westernized completely by living in the UK. She appears on screen smoking, drinking and wearing skimpy outfits, leading a life contrary to Indian culture and traditional values. Purab Aur Paschim is said to have inspired the 2007 film Namastey London starring Akshay Kumar & Katrina Kaif. The remake pays tribute to the original through a dialog in the film, where Akshay Kumar tells Katrina Kaif that if she wants to learn more about India, she should see Purab Aur Paschim. 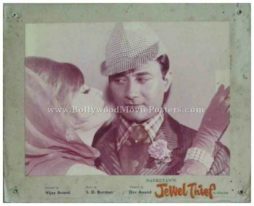 In the film, Manoj Kumar plays the son of a freedom fighter who goes to London for higher studies where he meets Saira Banu and a love story unfolds. Purab Aur Paschim captures the dramatic differences between cultures of the East and West and explores the idea of intercultural relationships.